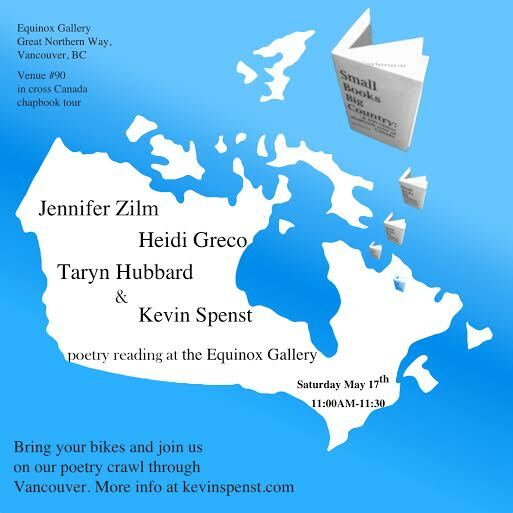 So Kevin Spenst is concluding his chapbook tour of Canada and there will be many festivities this Saturday throughout Vancouver. I am reading at 11am with Taryn Hubbard, Kevin and Heido Greco at the Equinox Gallery. There are several other readings throughout the day. This entry was posted in Chapbooks, Readings and tagged Heidi Greco, jennifer zilm;, kevin spenst, Poetry, Taryn Hubbard. Bookmark the permalink.